Happy 52nd Merdeka Day, Malaysia! 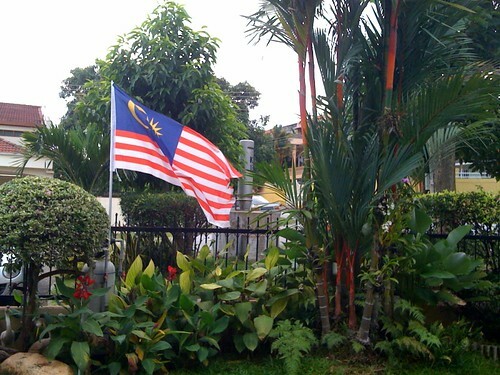 The Jalur Gemilang waving gloriously on the fence of my parents' home. “With a temple on our residential area, we cannot function properly as Muslims. The temple will disrupt our daily activities like prayers in the Surau. We cannot concentrate with the sounds coming from the temple”. If the non-Muslims in our country can put up with the sound of the azan that breaks the silence of dawn everyday, why can't you put up with such sounds coming from the temple occasionally? Muhibbah is not a one way street. I'm taking a quick break from my busy schedule to give props and shoutout to Cybersonique-dot-Org on its eighth birthday today. It's been a bit on the quiet side this year (only 23 entries including this one so far) but hopefully it'll still be around in the years to come providing the two or three of you out there some glorious insights into the goings-on in the void that is the mind of yours truly. It's unfortunate that I have to start off an entry by saying "Things have been going extremely busy the last few months that it's hard for me to actually sit down for a measly 5 minutes to write something on this weblog". So yes, things have been going extremely busy the last few months that it's hard for me to actually sit down for a measly 5 minutes to write something on this weblog. Lately, it just got crazier. I've been consistently sleeping three hours or less these days and at very irregular times. I haven't exercised as much as I'm supposed to. I lost 8kgs already since March. I'm fatigued and lethargic most of the time. I keep forgetting things. I only have sparse idea of what's going on in the world or with my family and friends today. If I do, it's either via Twitter or Facebook rather than from actual conversations or interactions. I hardly watch TV or listen to any new music out there. It's been ages since I actually went to the cinema to watch a movie and to top it all, I actually found unopened foodstuff that expired last February in my fridge. You may think that I should get laid to get my issues sorted out but I think I need professional help in this case.